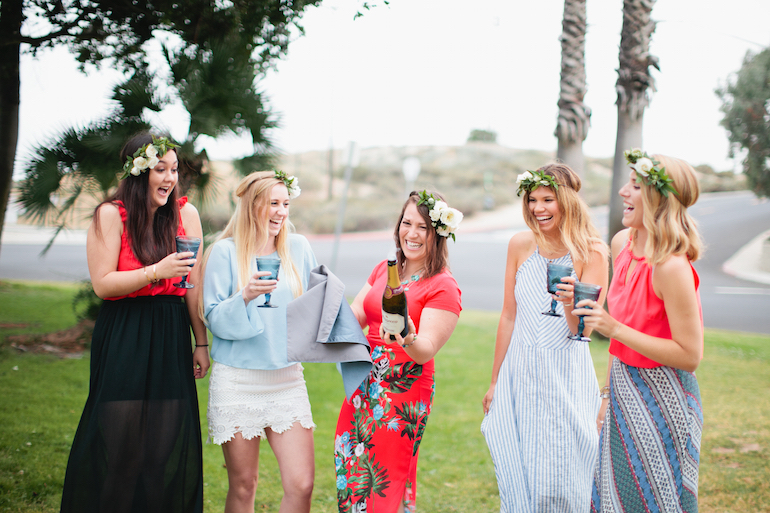 Fall is in the air and wedding season is still going strong here at Marisa Nicole Events! At the beginning of the summer, our team took a moment to gather for an al fresco dining photo session (and to take new images for the “about” section of our website). 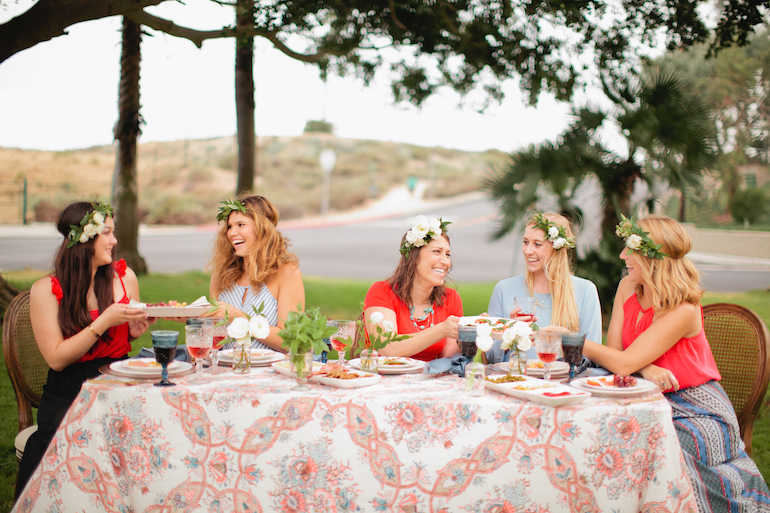 The best part of the Marisa Nicole Events crew is that we actually know how to have a good time together and are pretty obsessed with yummy cuisine, so it was only natural that we centered our annual team photoshoot around family style mezze, wine, and a gorgeous tablescape. 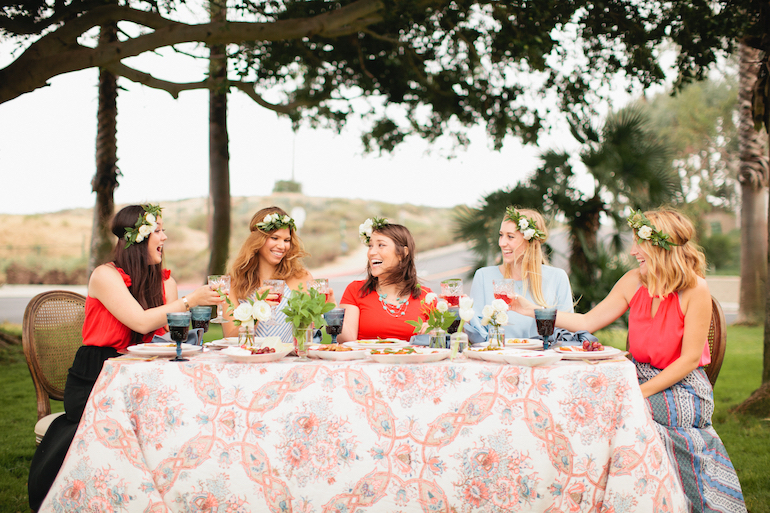 To craft our tablescape, we started with finding a rad linen that matched our brand. 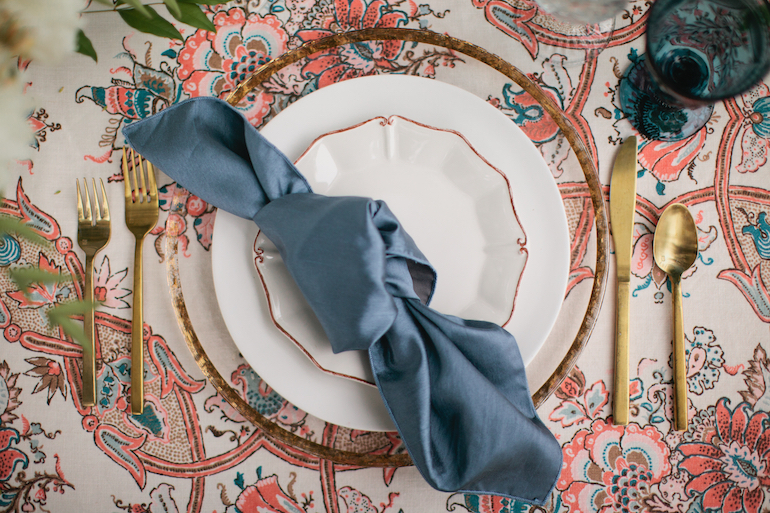 When I ran across this linen from La Tavola, which prominently featured an easy, delicate design in coral and blue, I knew it just bad to be the base of our family style feast. 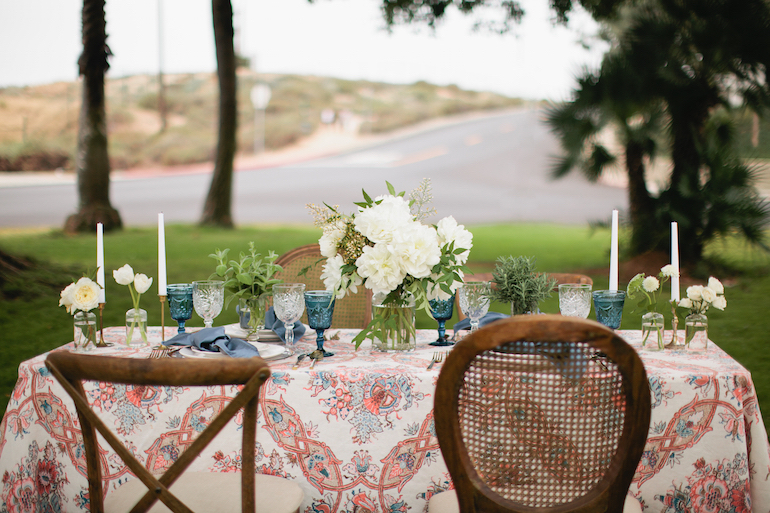 We paired this colorful table with mismatch natural wooden chairs from Premiere Party Rentals. After determining our base, we chose to fill our place settings with off-white china from Premiere that had a slight mediterranean/spanish detailed edging that created a unique shape. We layered these atop of a clean clear charger with a gold rim (swoon) and topped off the layers with a fab knotted linen napkin with just a touch of sheen. 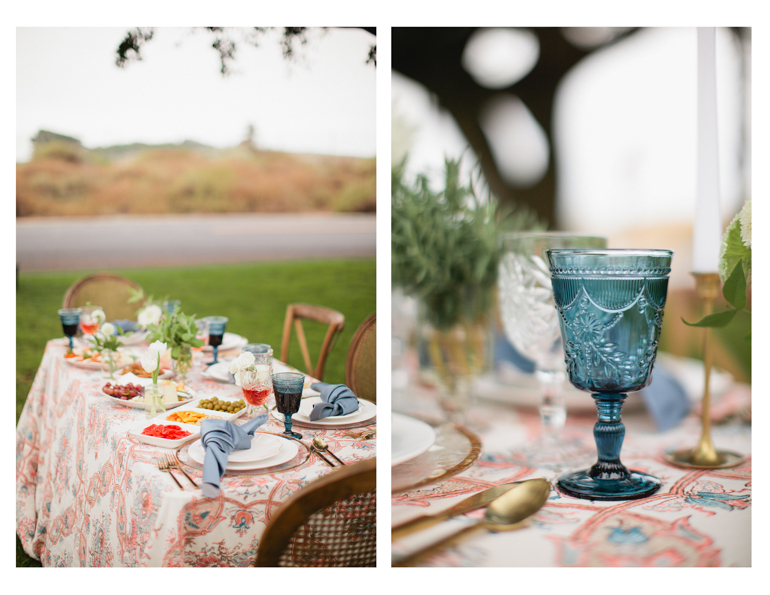 My favorite detail of our table was our cut crystal and blue glassware. The blue goblets, yet again, brought in the cool hue of our branding, while the crystal maintained that clean, fancy feel. Enchanted Garden Floral Design came in for the win with gorgeous white blooms and fresh greenery. Varying potted fresh herbs stretched down the length of the table. We added taper candles to add in just a touch of glam. 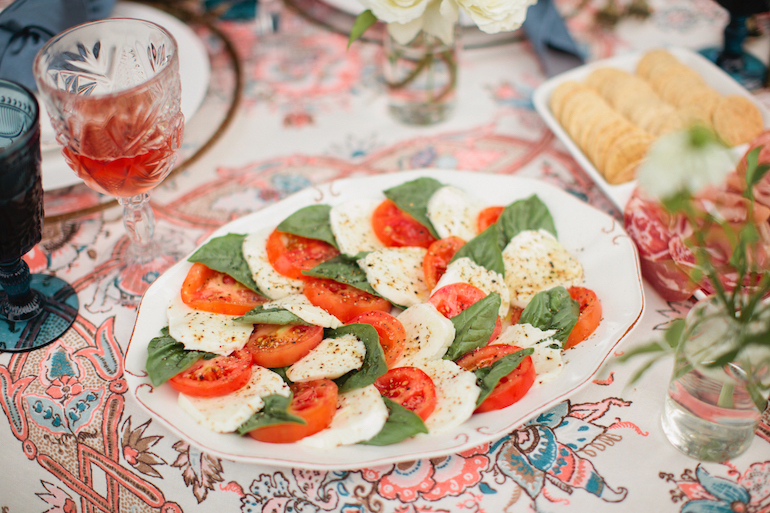 After designing our tablescape, we turned our focus to our feast. 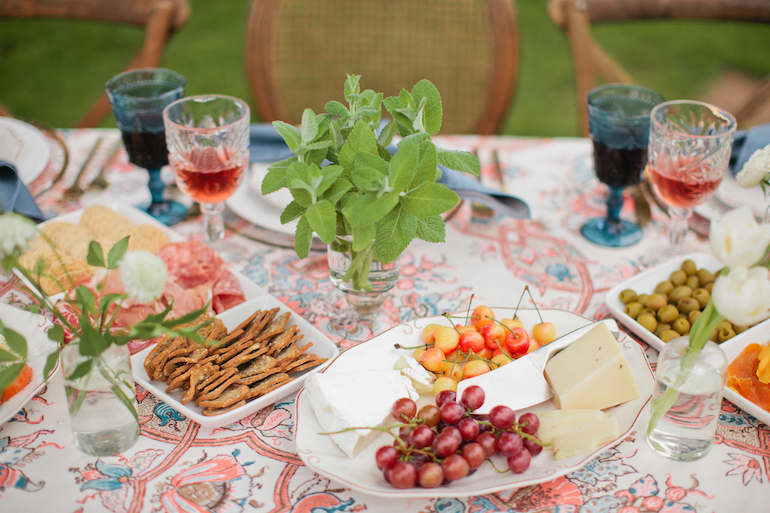 We all love charcuterie and graze foods: olives, marinated peppers, cheese, grapes, cherries even caprese salad… If it looked fresh and yummy, we incorporated it into our meal. You can’t wine and dine without the former, so we popped open a bottle of pinot noir and rose to accompany our mezze. The rose in the cut crystal glassware perfectly added another hint of coral that we needed to drive home our branding (rose all day, ladies!). We even popped a bottle of bubbly to start off the meal prior to relaxing over each other’s company and our family style feast. We hope you enjoyed this shoot as much as we enjoyed sharing it! 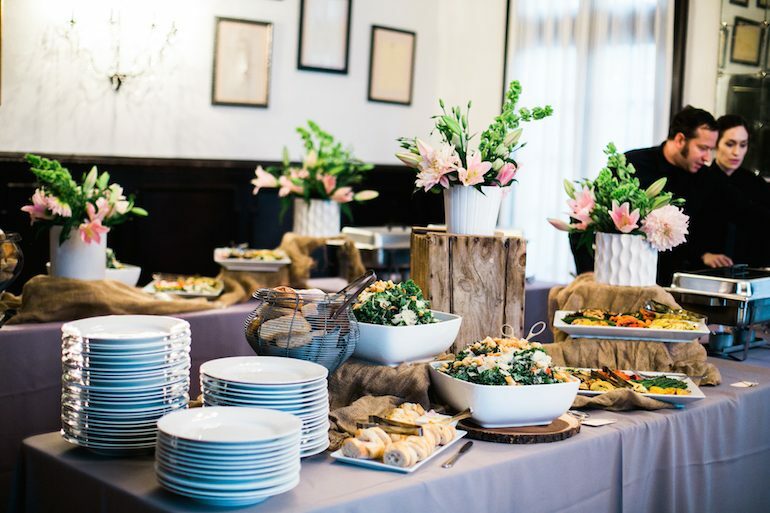 Most importantly, we would like to give some vendor love to La Tavola Linens, Enchanted Garden Floral Design, and Premiere Party Rentals for helping us put together this fabulous dinner party. We could not be more thankful. 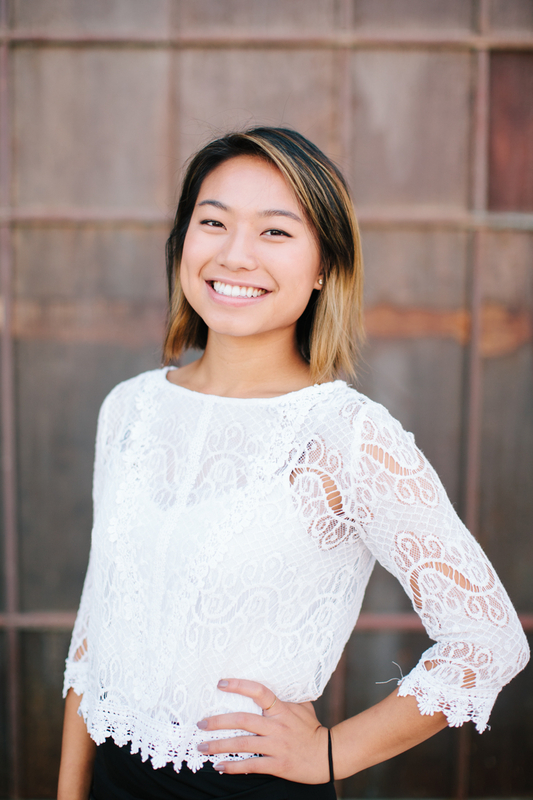 Oh, and don’t forget to check out our new updated “about” page here to officially meet the team! 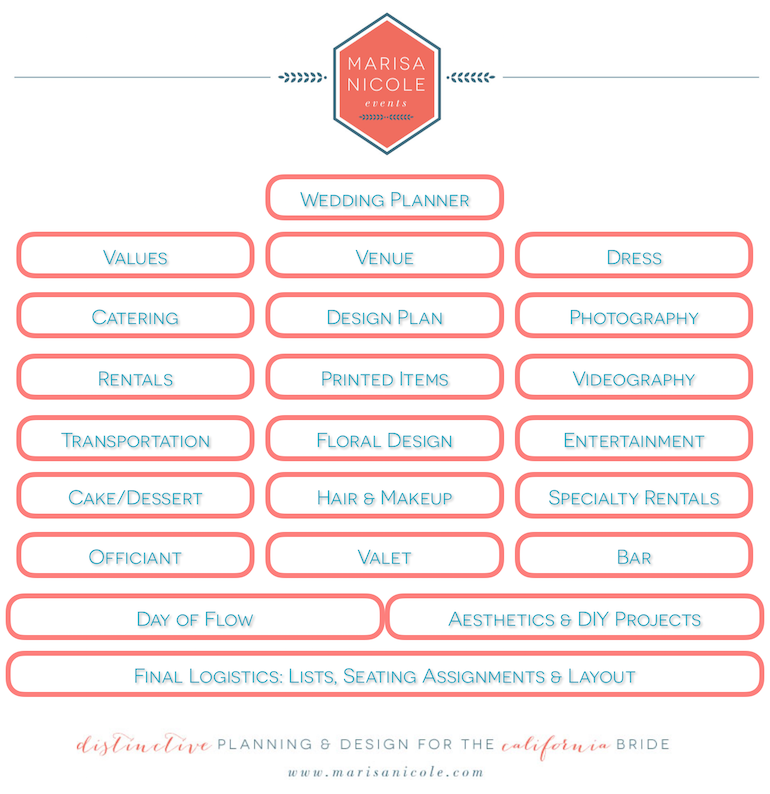 Favorite Wedding Blog: Style Me Pretty! I love the “Planning & Advice” section because it has information on anything you need to know about your wedding. 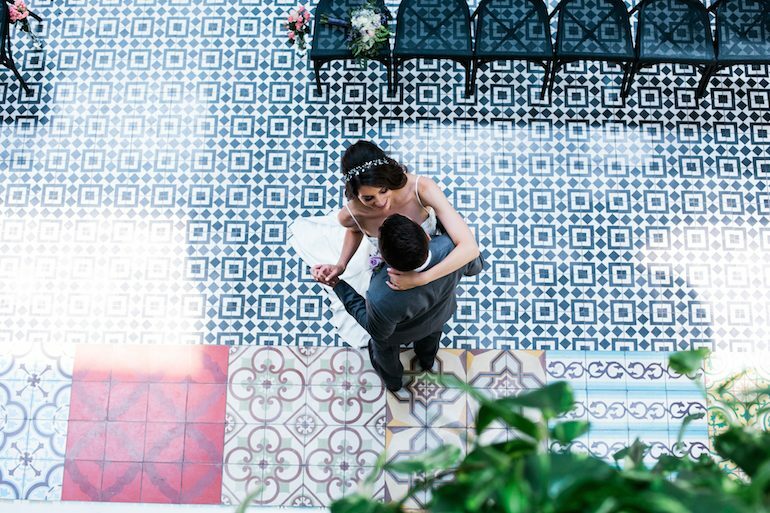 I also love the Vault that has an endless number of pictures from real weddings to use for your own wedding inspiration. 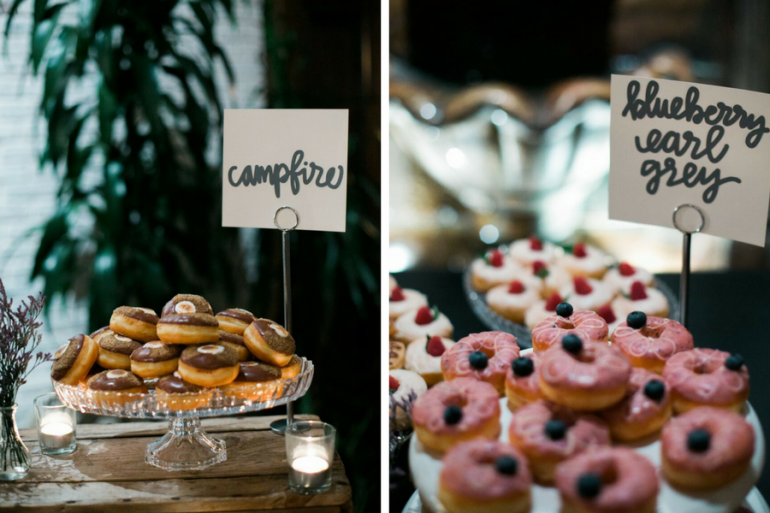 Describe the Perfect Wedding Cake Flavor Combo: Vanilla cake with strawberry flavored icing or vice versa. I think the strawberry adds a hint of flavor that makes a simple vanilla cake just perfect! 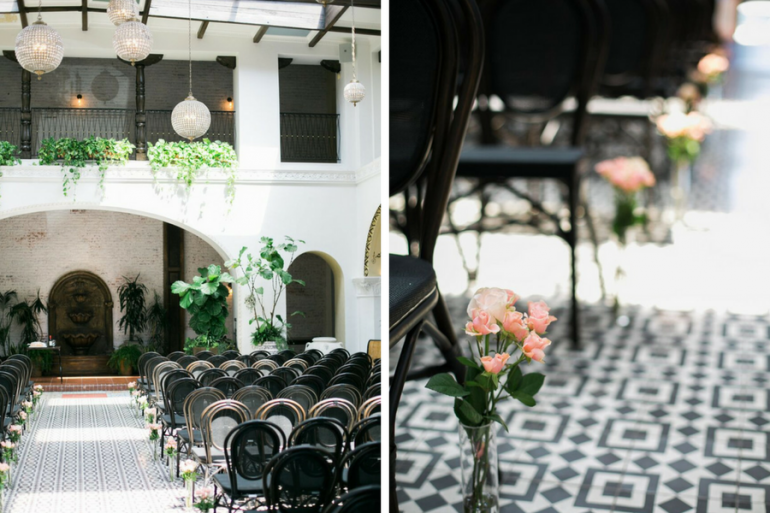 Favorite Styling Genre for Event Design: Not to be cliché, but I would have to say that a Romantic style wedding is my favorite. I love the color combinations of white, pastels, and greenery. 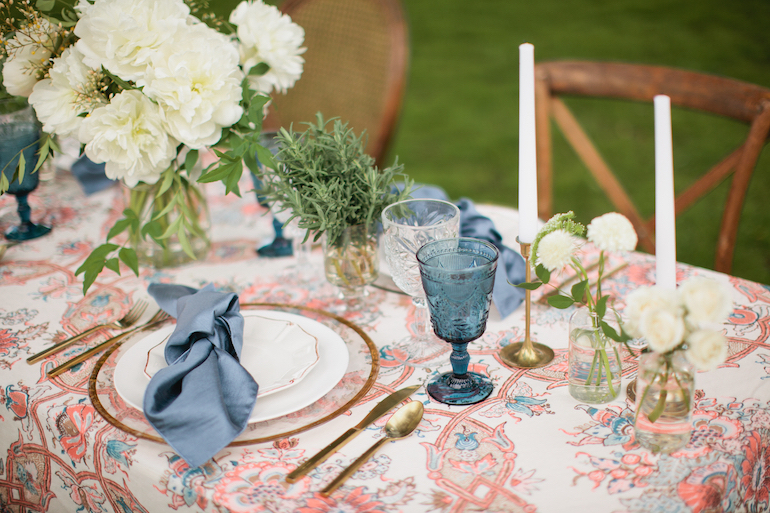 These colors can make the wedding look aesthetically B-E-A-Utiful! Event Planning Super Hero Skill: Being at the right place at the right time. I know how to scope out the scene and recognize exactly where I am needed. Veil, Flower or Headpiece? : All of them! I think the perfect headpiece would be a beautiful flower crown with a veil trailing behind. Why shouldn’t the bride look like a queen on her big day? Favorite Wedding Tradition: The couple’s first dance. I think the song is a good indicator of the couple’s connection with one another. It makes it all the more special when they are able to make that connection in front of all the people they love. The moment in every wedding that never fails to bring you to tears: When the couple is announcing their vows and the groom is trying not to cry. It’s the most heartwarming thing to see a couple cry of joy for being able to spend the rest of their lives with their partner. That’s just some information about me. I’ll be around for the next few months; so if you see me around, don’t hesitate to say hi! 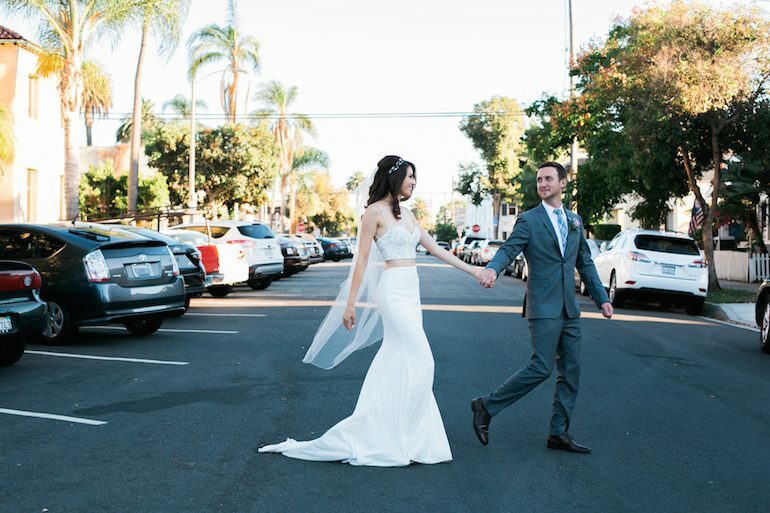 Long Beach Love Story: Michelle & Ryan Married! 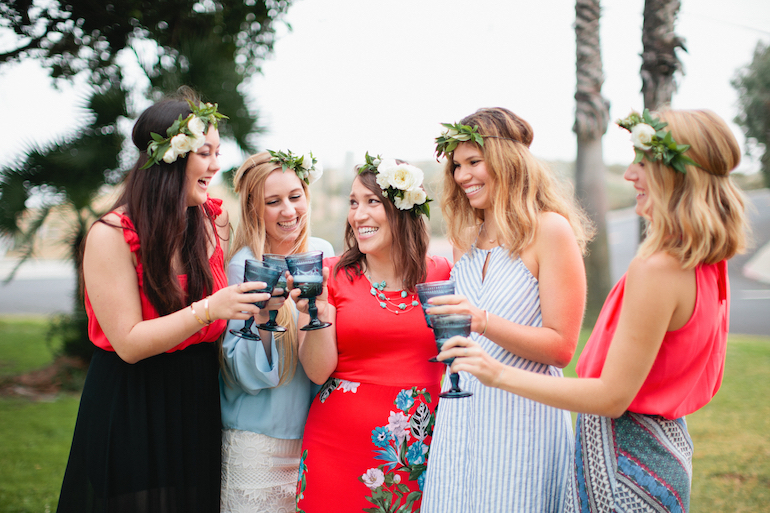 As a wedding planner, it is not every day that you get to help an old friend get hitched. So for the second week in a row, we are very excited to share a wedding that is extra special to the Marisa Nicole team. This is the wedding of Ryan & Michelle! I had the pleasure of meeting Ryan in college, and we’ve been good friends ever since. When Ryan shared the good news of his engagement to the lovely Michelle, I was more than happy to help. 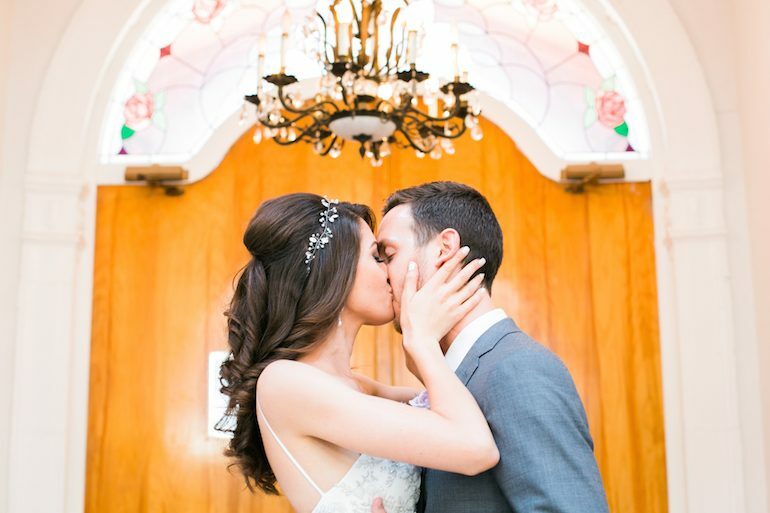 These two lovebirds got hitched at the historic Ebell of Long Beach. 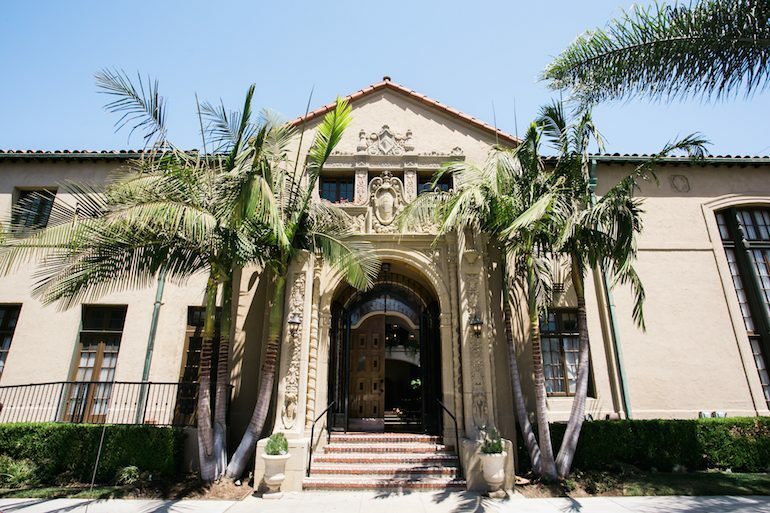 This 1920’s architectural beauty is reminiscent of the Spanish-Revival, making it the perfect backdrop for a simple elegant design with DIY touches. 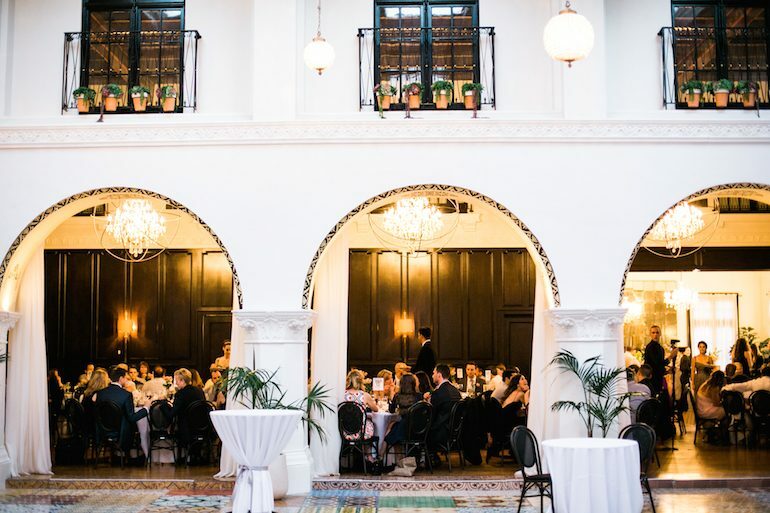 Between the indoor courtyard, tiled floors, sculpted portico, old-school parlor, fountain, chandeliers, and dark-wood dining room, this venue and all of it’s eccentric, vintage decor speaks for itself. 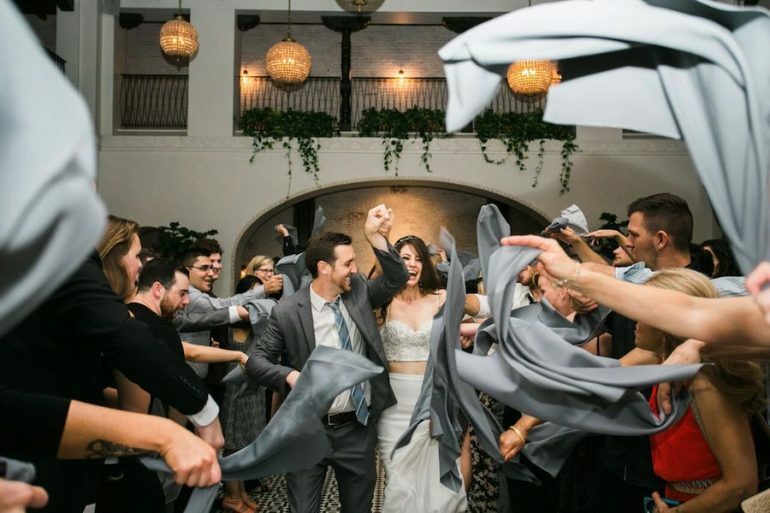 As if this venue wasn’t perfect enough for the couple, it also happens to be located right across the street from one of the couple’s favorite coffee shops. 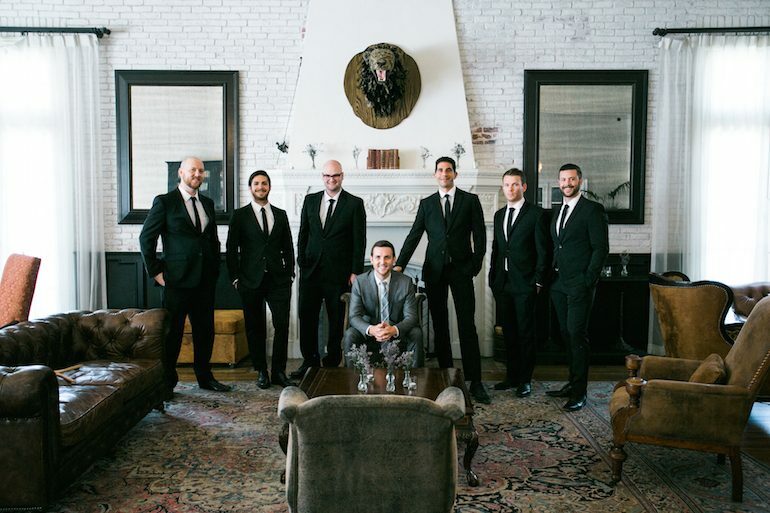 Immediately after running down the aisle, the bridal party followed and the whole group sipped on cappuccinos and espresso before heading back over to join cocktail hour. Their overall design was clean and elegant. 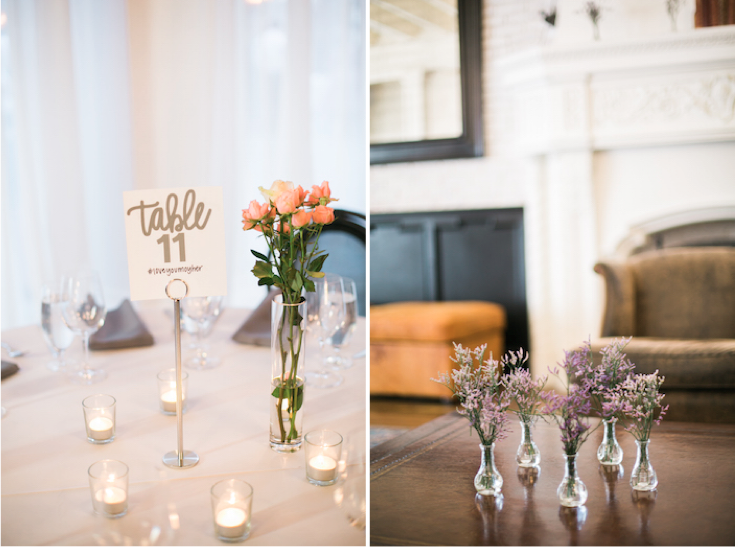 Not wanting to take away from the venues beauty, Ryan and Michelle opted for simple florals. They lined their aisle with long, single-stem pink roses, and repurposed them as their centerpieces. Their cocktail hour, which took place in the parlor, was sprinkled with dainty florals and candles. 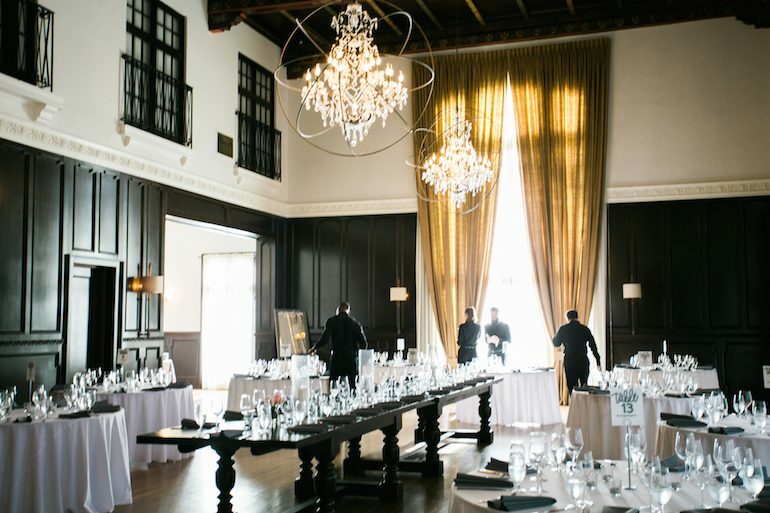 This couple proved that bud vases and votives still have the power to transform a room. This was truly a family affair. 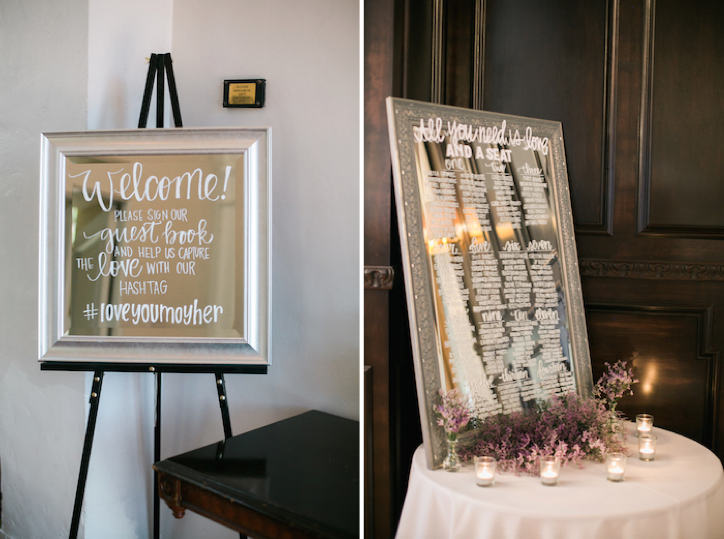 With help from both sides of the family (and even their bridal party & friends! 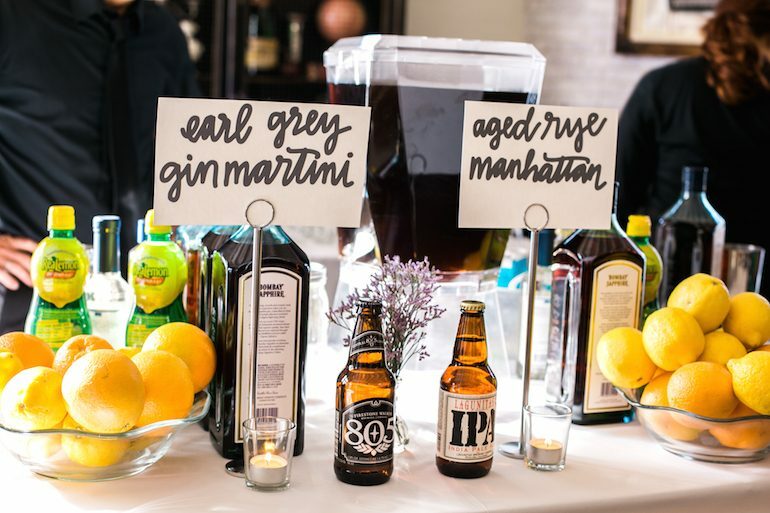 ), they crafted a seating chart, welcome sign, signature cocktails, and signage for both the bar & dessert table, and table numbers. Speaking of food, Baked It Myself served up a delicious buffet that left everyone happy and full. 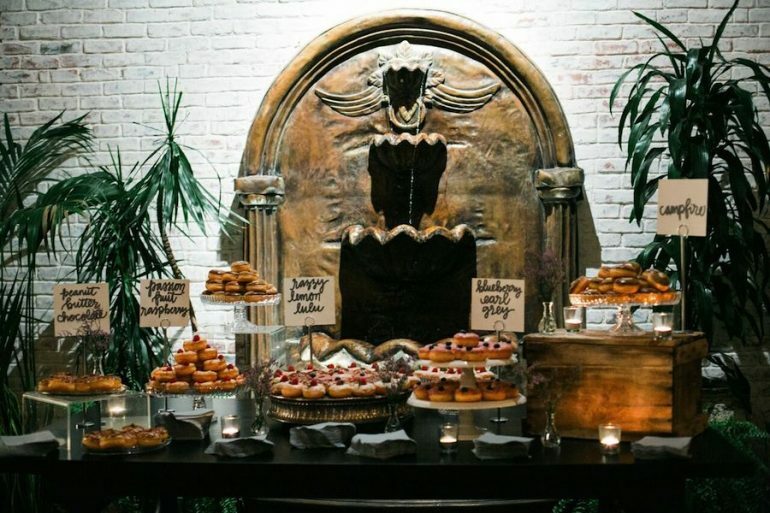 For dessert, the couple brought in a new school twist to offset their historic surroundings by serving donuts instead of the traditional cake or small treats. Donut Snob offered up fun flavors like “blueberry earl grey” and “razzy lemon lulu”. To end the night, the couple was cheered goodbye by all their friends and family -it truly was the perfect end to a perfect night. So to my dear friend and your beautiful wife, we wish you all the best! Thank you for letting us be a part of your special day. For more inspiration behind this fab wedding, you can watch their wedding video here.